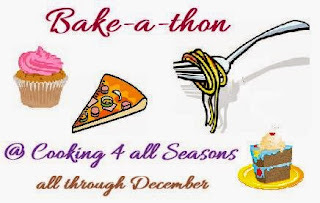 I am back with another baked goodie today .As promised already this December blog will be flooded with Christmas specials and baked goodies .Apart from that I have joined the Bake-a-thon event hosted by SriValli this December. Where we will be posting baked goodies on all Monday, Wednesday and Friday. I have linked the event at the bottom of my post do check it out!! About Almond Tutti Frutti Biscotti is it similar to the usual Rusk but with from modifications. 1. In a mixing bowl add in the Cane Sugar ,Butter, Salt ,Baking powder, Vanilla essence. 2. Whisk all the ingredients together to form a homogeneous mixture .Next break open an egg, Whisk well such that it blends well with the rest of the ingredients. 3. Add in the AP Flour and fold gently with the rest of the ingredients .Add in the Chopped Almonds and tutti frutti and mix evenly. 4. Knead everything together to form a soft dough. Divide the dough into two equal proportions and gently flatten and for a log such that it resemble a rectangle log ,Preheat the oven at 180 Deg C for 10 mins and then bake in 180 Deg C for about 25 mins. Once done allow them to cool completely. 5. Sprinkle water on the baked biscotti and chop it into wedges using a serrated knife. This will prevent the biscotti from crumbling while chopping .Arrange the Chopped biscotti in the baking tray and bake in 160 Deg c for another 15-20 mins till the edges of the biscotti becomes crisp and golden brown. Allow it to cool completely after baking and store it into air tight containers. Egg can be replaced by any egg replacer. Always use a serrated knife while chopping the biscotti else it will crumble while cutting. Sprinkle water before chopping the biscotti. Tastes best when served as an evening snack along with Chai. YUM! These tutti frutti biscotti looks divine. Perfect for this festive time. Those tutti frutti biscotti looks so perfect just like the store bought ones. Very nicely made. Welcome to the group. Thanks a ton Sapna !! Crunch into this pretty biscotti. Love its vibrant attractiveness. Tutti frutti in bisscotti soun ds yummy!! Welcome to bake-a-thon group and looking forward to your bakes. Thanks a ton Usha!! I am so excited about the event!! You are right David!! Your chocolate biscotti was too good!! They are so festive and delicious! I been wanting to making something similar .Yours looks good!! Thanks a lot PJ !! Welcome to my space!! Those biscotti seem to have turned out so good..very nicely baked.. Thanks Srivalli!! Welcome to my space!! Any thing having tutti fruity fascinates me always. This biscotti is a good accompaniment to tea. Thank you so much Ritu!! Those biscottis looks absolutely gorgeous and those tutti frutti bites gives a fabulous look to them. The biscotti looks so yum. Those tutti frutti looks like jewels in the bake. Welcome to our lovely group.. Thanks dear Gayathri!! I am always a great fan of your bakes!! So happy to get a feedback from you!! So delighted to be a part of this wonderful group!! Perfectly done Biscottis, feel like just grabbing one of the screen. love biscotti and with tutti frutti these look awesome! Absolutely delicious looking biscottis,perfect with a cup of tea.. Delicious and colorful looking biscotti!! perfect with our evening cuppa!! Colorful and delicious biscotti. Love the addition of tutti fruity, gives them an Indian twist.